It's easy to roast a stuffed or unstuffed turkey for Thanksgiving or for any occasion. Before roasting your turkey, ensure that you know the difference between stuffing and dressing. This recipe, from ​​"Blue Ribbon Country Cookbook"​ by Diane Roupe, makes a 3/4- to 1-pound serving per guest. 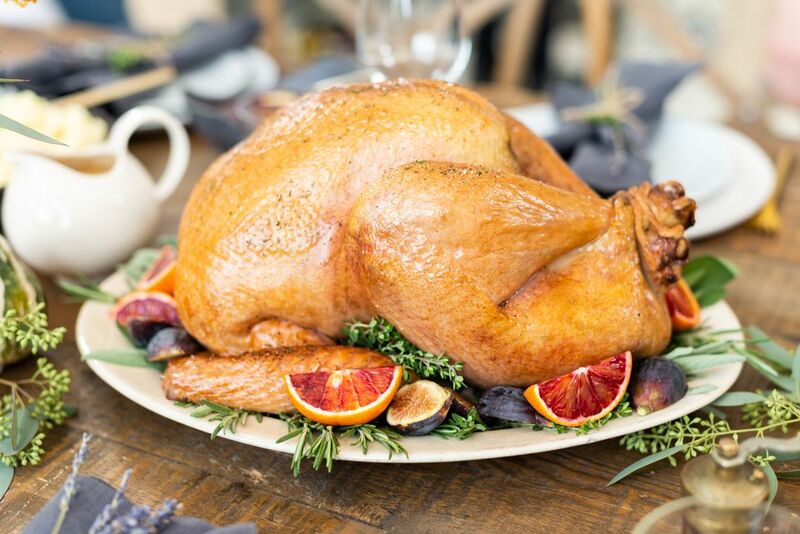 You can refrigerate a whole, fresh–not frozen–turkey safely for up to two days after you buy it before roasting. Safely thaw your frozen turkey. Do not stuff the turkey until you are ready to roast it. When you are ready to roast, rinse the outside and cavities of the bird under cold, running water. Cut away and discard any fat remaining. Place the turkey on several layers of paper towels to drain it. Using additional paper towels, pat the outside and cavities dry. Sprinkle the cavities liberally with salt and pepper. Stand the bird on its tail end in a large bowl. Using a tablespoon, stuff the neck cavity loosely with dressing. Pull the neck skin over the dressing and fasten it to the body with a poultry skewer. Turn the turkey and place the neck end in the bowl. Stuff the body cavity loosely with dressing. Stuff the dressing loosely because dressing expands during cooking. Remove the turkey from the bowl and lay the bird, breast-side up, on a piece of waxed paper or directly on a clean work surface. Pull the legs close to the body and tie the ends with a cotton string. If the tail has been left on the bird, tie the legs to the tail to partially close the body cavity. Some frozen turkeys are packed with a metal clamp to secure the legs, in which case it is not necessary to tie the legs with string. Fold the wings under the bird to provide a platform for roasting. Place the turkey, breast-side up, on a wire rack in a shallow roasting pan. Brush all of the exposed surfaces with vegetable oil. Sprinkle liberally with your choice of herbs, spices, salt, and pepper. Insert a meat thermometer into one of the inner thigh areas near the breast, ensuring that the tip of the thermometer does not touch the bone. Many commercial turkeys are packed with a disposable thermometer inserted into the breast, which will pop up when the bird is done. Instead, insert a standard meat thermometer into the thickest part of the thigh when you place the turkey in the oven; this is a much better way to determine when the turkey is done. The roasting time may vary up to 30 minutes, depending on the bird and the oven. Use the meat thermometer to check the temperature of the dressing. The center of the dressing inside the bird or in a separate baking dish must reach 165 F to ensure food safety. Remove the aluminum foil about 30 minutes before the turkey is done to complete the browning of the bird. When done, remove the turkey from the oven and place it on a serving platter or carving board; cover the turkey loosely with aluminum foil and let it stand 10 minutes before carving it. Meanwhile, make the turkey gravy. Remove all of the dressing from the neck and body cavities before carving the turkey. Pour the gravy into a gravy boat. Follow the previous instructions, omitting the stuffing. Roast the turkey until the meat thermometer reaches 180 F.
Did You Know You Can Roast Your Thanksgiving Turkey the Day Before?